First book of the year! From my LTST. The multiple Harvey and Eisner award-winning fantasy is now collected in one volume! A fable for modern times, Castle Waiting is a fairy tale that's not about rescuing the princess, saving the kingdom, or fighting the ultimate war between Good and Evil — but about being a hero in your own home. The 456-page Castle Waiting graphic novel tells the story of an isolated, abandoned castle, and the eccentric inhabitants who bring it back to life. A fable for modern times, Castle Waiting is a fairy tale that's not about rescuing the princess, saving the kingdom, or fighting the ultimate war between Good and Evil — but about being a hero in your own home. The opening story, "The Brambly Hedge," tells the origin of the castle itself, which is abandoned by its princess in a comic twist on "Sleeping Beauty" when she rides off into the sunset with her Prince Charming. The castle becomes a refuge for misfits, outcasts, and others seeking sanctuary, playing host to a lively and colorful cast of characters that inhabits the subsequent stories, including a talking anthropomorphic horse, a mysteriously pregnant Lady on the run, and a bearded nun. For the first time, Fantagraphics' Castle Waiting collects the first volume of the Harvey and Eisner Award-winning* comic book series into one hearty hardcover. Linda Medley lavishly illustrates Castle Waiting in a classic visual style reminiscent of Arthur Rackham and William Heath Robinson. Blending elements from a variety of sources—fairy tales, folklore, nursery rhymes—Medley tells the story of the everyday lives of fantastic characters with humor, intelligence, and insight into human nature. 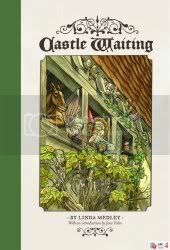 Castle Waiting can be read on multiple levels and can be enjoyed by readers of all ages. What a fantastic tale. While nothing major happens in this story, Castle Waiting leaves you completely fulfilled with its characters and charm. While some of the stories may seem a little familiar, the complete package is a refreshing tale that is composed of several stories connected inside the story, as we learn a little of each character through either their actions at Castle Waiting, or the stories that they tell. The whole thing feels very much like The Canterbury Tales. The current residents of Castle Waiting are just that; they are waiting. Waiting for a new king to take residence in the castle after the last king was killed while trying to protect his daughter from a fate curiously similar to that of Sleeping Beauty. In the meantime, while they are waiting, they take in any stranger who is seeking refuge there, where we meet Lady Jain, who has a secret all her own about her unborn child. (The story leaves several mysteries unsolved, that I hope will be revealed in later editions.) We also meet Prudence, Patience and Plenty, the last remaining original inhabitants of the castle, the metalsmith Iron Henry, castle steward Rackham Adjutant, castle cook Dinah Lucina and her son Simon, the mysterious Dr. Fell, Sister Peace of the Solicitines and Chess, the castle knight. Together they create a hodgepodge of a family that comes together and takes care of their own. It's a great story of diversity and how that diversity can bring people together under then most mundane or special ways. Linda Medley's story left me laughing in several places, and her art is fresh and unencumbered. I'm anxiously awaiting the sequel!